The recent ruling of NFL commissioner on the Michael Vick case has created quite a conundrum between what is acceptable punishment and whether he is the right man to levy it. I find myself in a perplexed state about his ruling and which side of the equation I am on. After reading multiple articles and blogs, listening to the talking heads on sports radio and TV, and even hearing the political pundits weigh in, I realize that I am in a unique situation in that I do not stand on one side of the argument or the other. It seems that most people had their minds made up well before a decision even came down from Goodell’s office. It seems to me that most people didn’t even care what Goodell’s decision was, because they were laying in waiting to tell you what he did wrong. You see, this issue is not cut and dry. There is no black and white here, but there is a gray matter that needs to be explored. The plethora of uproarious reactions to the Goodell decision says more about the current minds of sports fans, socialites, politicos, and pundits, than it does about the status of why we’ve gotten here in the first place. It’s about time we explore this and look for a rational explanation instead of accusations, finger pointing, and excuses. It’s time for The Sports Mind to tell it like it is. - Vick committed horrific crimes, for an established period of time (it wasn’t a one-time offense). - He then postured, tapdanced, outright lied, and then sang like a bird to save himself. - Our justice system charged and convicted him of these crimes, and subsequently punished him. - Vick served his sentence and paid what the court determined was “his debt” to society. - Vick is now looking for a job and attempting to solve his financial woes. Now that we have established the plain facts of the case, it’s time to look at this from a plain view. The problem with many of the opinions out there is that they come from people and places that are out of touch with reality. They have lost all concept of what it is like to love in the real world as a real-life citizen where the concept of special privileges extends to being comp’d a beer at the local pub and getting to leave work at noon one Friday a month in the summer. It’s time we listen to the people who make up this country, not the ones who seemingly have it all, yet can’t figure out how to enjoy it. Is Roger Goodell this era’ modern cowboy vigilante who thinks he can (and should) police the actions of those under his watch because he can do it better than our American justice system? Or is he just another boss of an organization who needs to set some ground rules and punishments for those who want to be a part of his organization? Let’s draw some parallels to what happened here. Let’s say Rick is a high-powered Wall Street stockbroker. Rick was arrested (for what doesn’t matter for purposes of the example) and convicted of a federal crime. He served out his sentence in jail and decides he needs to get back to work to put his life back on track. If you think Rick can walk back onto a trading desk, or interview with Goldman Sachs and start the money rolling back in, then you are sorely mistaken. You see, in the securities industry there is the Securities and Exchange Commission (SEC), the Financial RA (FINRA), and various other state agencies that have to decide whether or not they want to license you to work in their industry. They have the right, as they often do, to turn down applicants for a criminal history and other reasons. Rick can cry foul all he wants but the boss(es) of those agencies didn’t even let the companies decide whether Rick was worthy of being employed by them. They decided for them, just as Roger Goodell did, and had the right to, make that decision on behalf of the teams. This parallel does not only apply to the financial industry. Virtually every industry of American business has some sort of governing body, that through policing, licensing, or statutory rights, can control who works in an industry. Insurance agents, casino dealers, bartenders, barbers/hairstylists, realtors, electricians, contractors; they all run the risk of running afoul of the governing bodies of their industry and potentially losing a career for a bad life decision. Now we can ask ourselves, well if that is the case, why is Goodell even offering him another opportunity at all? Does this make him a softie, or is he just willing to give another guy a chance? Well if he wanted to give him another chance, why the 6 game holdback from the regular season? Goodell claims it is in Vick’s best interest and to get him acclimated slowly back into the game. Why now has the commissioner decided to make yet another judgment on behalf of the member teams? Shouldn’t they decide, if he is their employee, how quickly he can contribute to their company? This is where Goodell’s “conditional reinstatement” felt more like another power grabbing ploy than an act of a righteous man making a decision for what he felt was in everybody’s best interest. All I can say is that Goodell had better give Donte Stallworth a MUCH more severe punishment (career-wise) than Mike Vick. If he is the cowboy he claims to be, policing the players on behalf of our society who is tired of special treatment given to the people who need it the least, then he needs to correct the mistake our American justice system made on that one. 30-days for Stallworth was a travesty and a sham that Goodell needs to correct. If Tagliabue had come down on Leonard Little harder in 1999, maybe Stallworth would have been more cautious in his actions. Goodell needs to learn that there better be a method to his madness, because as soon as he starts correcting the law, he needs to be sure the punishment fits the crime. It is a slippery slope to tread down because when you set a precedent of making your own laws and punishments, you will be watched even more closely than if you stood by idle. This won’t be a problem if your intentions are pure, but whose ever are? I’ll be watching you, Roger, to make sure there is no disparity between where your morality lies and what your punishments say to our society. The problem is, I don’t think he is up to the task. 1. In your example with Rick: Rick is not prohibited from being hired. If someone wants to take a chance on him, he’s right back in the game. He doesn’t even have to serve a “suspension” where he is unable to work for the first 30 days of his new job. If hired, it can be pretty much back to normal for Rick in his career. 2. 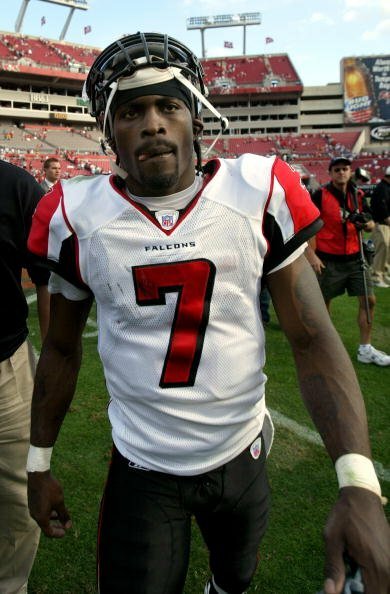 To be a bit nit-picky, Michael Vick financed a dog fighting organization. He did not kill dogs as your chart states. Yes, his money/actions allowed this to happen but he was not charged/convicted with physically killing an animal. 3. Roger Goodell is the commissioner (the president/COO) of the NFL (the company). I believe he has every right to make a judgement such as Michael Vick’s punishment without consulting with teams. The teams would be lucky if he did because that does not happen in most companies! Goodell’s personal conduct policy is finally a step in the right direction for the NFL. I agree that the punishments should be fair across the board but how does one decide if one crime is worse than another? Is being arrested once for a weapons charge worse than being arrested 5 times for crimes such as assault, drug posession, & DUI? Who should be suspended? With the unfortuante state that the NFL is in with its players, I think he is going to have to go on a case by case basis for a while and that might not always mean that the public will agree with his decisions. I think the bigger questions are why are players suspended from the game but still paid their salaries and why does the NFL punish big name players but ignore the legal problems that plague the 2nd/3rd string players? 1) Rick most certainly may be either suspended, or prevented from being hired. In many trades, there are governing bodies that must license and police people who practice in their trade. Real estate professionals, financial professionals, gaming workers, etc. all must have the requisite licensure to work in that field. Even if a top firm (team) wanted to hire Rick, if the governing body (like the SEC, or state, or NFL…) decides not to “license” him, he will not get a job no matter how badly a company (team) wants him. Goodell and the NFL are that governing body, for better or worse. 2) He may not have been directly charged with killing an animal, but testimony states that he was “consulted with” before the torture and killing of dogs who lost too many fights. To further the point, if I pay a hitman to kill someone and they do the killing…am I any better or less guilty in the killing than the guy I hired? 3) I completely agree Goodell has the write to make decisions without consulting the teams. Keep in mind though, while the NFL itself is its own organization, the office of the commissioner’s role is strictly to act on behalf of the team owners in order to maximize their profits. In that sense, the NFL serves more as a regulatory body than its own entity. You raise some excellent points about the disparity of the punishments and lack of toelrance for crimes by lower-tier players vs. top talents. I do think Goodell put himself in this sticky situation by trying to “correct” the justice system. I think that he opens himself up for scrutiny every time he adds more punishment (or doesn’t) onto the legal system. He will be criticized when he does not add more time, and looked at harshly when he thinks he can do better than due process and a jury of peers.